With the RHS Orchid Show and Spring Plant Fair just a week and a half away our thoughts have turned to identifying the plants that could make our London display as good as the one last week in Paris. 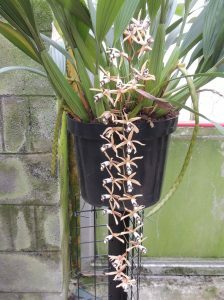 One possibility is our large plant of Coelogyne pulverula. We have tied the pot to the top of a steel tower to protect the long pendulous spikes from damage both in the greenhouse and in transit. There are eight flower spikes on the plant with a probable six to be in flower for the show – the spike already out will probably be over! The flowers do bruise quite easily and so it is worth moving a plant in spike to a safe place, like ours in the photo, for the flower spikes to grow where they wont touch things or be knocked. We took a plant of this species in flower to Blue Peter in about 1997. 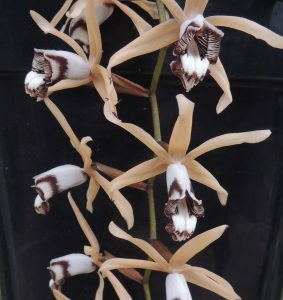 The three rehearsals meant that the actual filming featured the crushed and bruised flowers of Coelogyne pulverula – I hope that ours wont look like that for London!